The Unraveling: High Hopes and Missed Opportunities in Iraq. Emma Sky. New York, NY: Public Affairs, 2015. 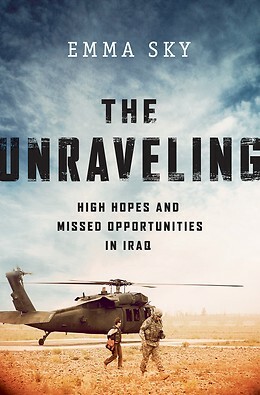 Emma Sky writing The Unraveling provides a unique outlook on coalition, and specifically United States operations in Iraq, by the most unlikely person to go to war. Sky is a Middle East specialist who lived and studied in the region. She is fluent in Arabic, a British pacifist that had never worked with British forces much less Americans, a woman in a male dominated society (both Iraqi and American military), and Jewish in an Arab land. The book opens with Sky’s thesis that most strategists planning Operation Iraqi Freedom (OIF) missed, “the challenges of nation building and how the overthrow of an authoritarian regime can lead to state collapse and conflict.” Sky’s thesis is similar to one of Lawrence of Arabia’s thesis in Seven Pillars of Wisdom, that fighting a counter insurgency is like eating soup with a knife. Sky offers the reader some answers to the question, “what went wrong” with U.S. policy. Today, Congress and the world are debating how the international community and the U.S. should or should not respond to the Syrian Civil War and the re-emergence of the Iraqi counter-insurgency. The book was released at a point when the Obama administration appeared to be on a slippery slope by providing mixed signals to the world with the conflict escalating; ordering a small limited force with a limited mission while stating it is a problem for Iraq to solve. Sky offers the reader some answers to the question, “what went wrong” with U.S. policy. Sky’s story like her service began with an appointment, expected to last for a few months, to the Coalition Provisional Authority (CPA) followed by appointment to the staff of Multi-national Corps Iraq and Multi-national Forces Iraq commanders General Ray Odierno and General David Petraeus. In May 2003, generals in Iraq were preparing to redeploy and Central Command Headquarters-Forward had shut down operations in Qatar to return to Tampa. The Bush administration initially expected that after the invasion the Iraqi people would assume sovereignty and the U.S. and coalition troops would go home. In May 2003, generals in Iraq were preparing to redeploy and Central Command Headquarters-Forward had shut down operations in Qatar to return to Tampa. Nevertheless, in Iraq, the CPA, led by Ambassador Bremer and Sky assigned to the CPA office in Kirkuk, were trying to cement the three main ethnic groups, Shi’a, Sunni, and Kurds, into a new state. Sky witnessed military officers, whose normal duties were to jump out of airplanes and blow things up, instead conduct diplomacy, form local councils and defuse the simplest issue without the appearance of favoritism. Sky was assigned to the staff of Colonel William Mayville, a brigade commander, who demonstrated his talent as both a combat commander and a diplomat, relying often on Sky’s advice and guidance in navigating the tribes and clans of northern Iraq. Although she points out many of the errors made by untrained soldiers, she observes they were always trying to do the right thing! Sky argues, while attached to CPA and working with Mayville’s brigade staff in Kirkuk, she tried to convince the military that, “how we treated people would affect how they reacted to us.” Mayville issued an order for the soldiers to put an Iraqi between “you [the soldier] and the problem.” However, Bremer, without much debate within the administration or in Iraq, dismissed the Iraqi Armed Forces and thousands of members of the Ba’ath Party (CPA Orders number 1 and 2). The dismissals removed Iraq’s social leaders and added to Iraq’s unemployment problem, cutting salaries and retirement benefits of the people that kept the government and industry running, and armed young men that resented the invasion of their homeland creating the insurgency that is still fighting today. Sky encountered a different Iraq when she returned after a year and half away and a learning curve involved in her new position as General Odierno’s political advisor (POLAD). Sky quickly saw the strategic issues facing the new corps commander, while she maintained relations with the friends and tribal leaders she had made on her first tour. She often would rely on these acquaintances to defuse problems encountered daily by U.S. forces. The change in leadership from General Petraus to General Odierno moved the U.S. from the surge period that created a space for Iraq and Prime Minister Nuri Maliki to establish power independent of U.S. forces. Maliki, instead of creating a new democratically based Iraq, instead created a Shi’a dominated dictatorship — mirroring the Saddam government — with Maliki directly controlling the Iraq security forces. The U.S. implemented the tactic of “by, with, and through” as it turned the fighting mission over to Iraq. Sky played a crucial role as the trusted interlocutor between General Odierno and the Iraqi government’s office charged with reconciling the Shi’a, Sunni, and Kurds in addition to instituting programs such as the reintegration of former officers into the army. The tribal leaders of Anbar province brought peace to the region by creating the “Shawa (Awakening)” or “Sons of Iraq (SOI)” which spread through the Sunni and some Shi’a areas. Supported by the U.S. forces, former insurgents challenged al-Qaeda in Iraq (AQI) but were less successful in it transitioning into the Iraqi National Army and Police. Reluctantly, Maliki accepted the SOI but then reneged on providing the SOI fighters positions in the army and police forces and mishandled their pay at a point when the U.S focus was on leaving. While reading The Unraveling, I relived many of the events Sky describes in the book, many with remorse that we could not have done more. The election of Barak Obama sealed the end of Operation Iraqi Freedom and U.S. operations. Maliki and his officers, appointed based on loyalty and not on professional competency, could or would not bring peace and stability to Iraq. While reading The Unraveling, I relived many of the events Sky describes in the book, many with remorse that we could not have done more. To those of us that lived and returned home, sometimes with the physical or mental wounds of the war, the book may help explain the war and help mend those wounds. The Unraveling demonstrates how badly a war can go when a nation does not apply all of its resources to the problem. The U.S. lacked diplomats trained and intimately knowledgeable of Iraq to work alongside the military in rebuilding what we broke. In some areas, military leaders performed the civil affairs duties successfully but in others, the military was the wrong tool to use. America, after each war swears there will never be another, but memories fade and the ramifications of going to war and sending troops into battle are replaced with the idea that the U.S. has the answer for every problem. Maybe having a staff pacifist is the answer? David Mattingly retired from the Navy as a Master Chief Intelligence Specialist and has continued to work as a senior intelligence analyst with over three years deployed to the Intelligence Directorate of U.S. and Multinational Forces Iraq. Mr. Mattingly holds a Master in Arts, focusing on terrorism and security analysis from American Military University. He is a member of the Military Writers Guild and has contributed to U.S. Naval Institute Proceedings, War on the Rocks, and the International Social Science Review.